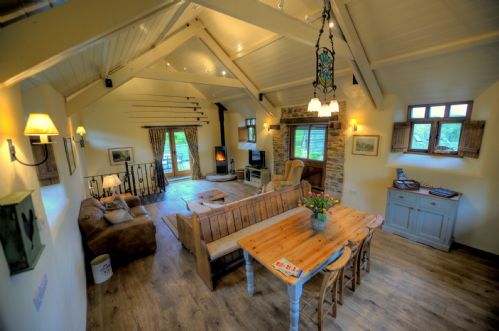 Tractor Barn is a recent 5* Gold conversion and sleeps six downstairs with two bathrooms, one ensuite. Its large living area upstairs is arrived at via a spiral staircase and has oak flooring and a contemporary woodburner. The living room opens onto an enclosed sun deck and Tractor Barn also has its own garden with a seven seater hot tub. Dogs are welcome in Tractor but the garden is not enclosed. This is 2nd time we’ve stayed at Devon Country Barns and it didn’t disappoint again! We have stayed in Cow Barn, now Tractor Barn and we are booking up Apple House for Easter. We love this place, it is exactly want you want to get away from things and relax! The cottage was beautiful and more than adequate for our needs. Beautiful setting and very peaceful. The owners were more than accommodating and the hot tub was amazing. We hired 3 of the cottages for my daughter 40th birthday , amazing . We had just one thing we would have liked more and that would have been able to go for a walk from the cottages. Wonderful week, this is our fourth visit to the Tractor Barn and the whole family love it. If there were any negatives to mention it would have to be the lack of an upstairs toilet and TV in the bedrooms. It would also have been nice if someone had visited us after our arrival to see if everything was okay. Having said all that, we would have no hesitation in future visits. We are coming back to Tractor Barn for several years now and we are outright enjoying it. The landlords Ute and Richard are more than friendly and helpful, eg when we needed a vet, Richard drove us there.The barn itself and the whole estate are very clean and tidy. Our two Flat Coated Retrievers loved it, especially the river at the bottom field. Situated right at the border of Devon and Cornwall there is plenty to do and see: coast and beaches, stately homes and gardens, romantic fishing ports and plenty of excellent restaurants. Wir waren im Mai zum 7. mal in Devon Country Barns und kommen im nächsten Jahr gerne wieder. Es stimmt einfach alles und Ute und Richard sind die besten Gastgeber, die man sich nur wünschen kann. Wahrscheinlich, weil sie von ihrem erfahrenen Team, fünf Flatcoated Retrievern und Herrn Fred stets kompetent unterstützt werden. Das Gelände ist herrlich, ein Paradies für Mensch und Tier. Die Häuser sind liebevoll und sehr geschmackvoll eingerichtet, es fehlt an nichts. Unsere Waschmaschine war defekt, schon nach einem Tag war das Problem gelöst. Die Umgebung, Gastronomie und das Dartmoor sind traumhaft schön, wir entdecken immer wieder Neues. This was our second time staying at Devon Country Barns and our first time in Tractor Barn. Once again, it was a fantastic break. We arrived to a home made cake and nice bottle of wine and Ute had kindly unpacked our food shopping which was delivered before we'd arrived. The accommodation was spacious and very comfortable with amazing views from every window. We took our dog this time and it offered the perfect surroundings with a huge field next to the barns for him to run around. We enjoyed the hot tub and log fire each evening. The farm shop in Lifton is amazing, offering a delicious range of meats, cheeses, cakes and chutneys. It was a shame to have to leave so we are already looking at when we can go back! Devon Country Barns is a definite recommendation for anyone looking for a relaxing and luxurious country getaway. 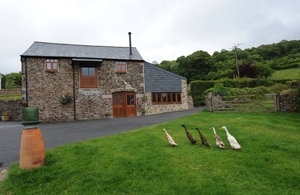 Spent our Christmas week in Tractor Barn - our 2nd stay at Devon Country Barns. A lovely, homely barn with everything you could possibly need. Loved the extra touches that Richard and Ute provide - there are always home baked goods and fresh eggs on arrival and I always enjoy The White Company toiletries that are provided. Whatever the weather, we can always pop our dog down for a run around near to the river at the bottom of the field and we always enjoy the hot tubs that come with each barn! Richard and Ute are the perfect hosts - warm and friendly. Our whole family love it here - including the dog, who loves to play with the 5 other Flat-Coated Retrievers and the adorable Terrier who lives in the big house. Kitchen was well stocked with gadgets and very good quality ovens which made cooking for everyone easy. Super comfy beds in all of the rooms which were immaculate, extra towels provided for the hot tub which was great and white company toiletries were a nice addition. We had a lovely weekend and would definitely go back. - we couldn’t find any kindling to make the fire with or an axe to chop kindling, we made do with lots of firefighters though so it didn’t affect our enjoyment.